Casual is like something relaxed, occasional not planned. Its a dress code in European tradition that emphasizes comfort and personal expression over presentation and formality. Casual means it has nothing to do with its style and make. These sarees gives comfort to daily wear and very famous in India. For everyday purpose no one can wear heavily worked and embroidered saree. That is why casual sarees are necessary. One can wear for long time to be comfortable, as they are light in weight. LadyBaazar having such latest casual saree collection. 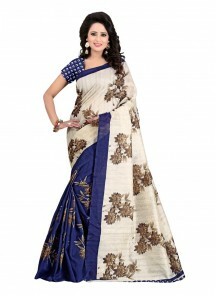 It made your casual saree online shopping easy and save your time as you don't need to go in any botique. Our online store is designed in such a way that you can sort and apply filters and at few clicks you can select your product easily. 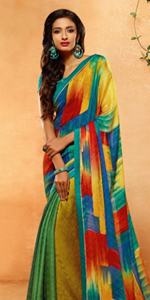 Casual wear sarees are available in different fabrics like silk and georgette. Also available in different colors like red, blue, cream, yellow and green. LadyBaazar is popular and leading store for it's best quality and on time delivery. We provide worldwide delivery with affordable shipping cost. Free shipping on orders above $400.